After a splendid Christmas Day lunch provided by good friends living in Brook Street, Wymeswold, the conversation flowed from topic to topic. For whatever reason I ventured to mention that I'd only heard of one haunted house in the village. 'Oh, really? But haven't you heard about… ' came the reply. And some suitable spooky tales then provided Christmas afternoon entertainment. Indeed I hadn't heard about the other somewhat spooky goings on. Exact details were provided but, for the sake of this article, I will not identify specific houses – after all, 'frequent paranormal events' is not the sort of 'feature' normally listed by estate agents, and such a reputation might make the properties more difficult to sell. The story I had heard concerned a three-storey Georgian building in Far Street. But my friend was able to go further. The problem was, she said, that in the middle of the night the occupants would be woken by the sound of a child falling down stairs then crying. As they had children of their own such disturbances could not be ignored, although every time they investigated their children were all sound asleep in bed. However, so far as I am aware, no one ever saw the source of the inexplicable sounds. 'Heard but not seen' also best describes a well-meaning paranormal visitor to a house in Church Street. Sitting comfortably in their lounge, a female voice asks the woman living there 'Are you all right, dear?' However the voice seemingly has no interest in the well-being of the man living there, as he has never heard such inexplicable voices. However, several successive occupants of the house have seen a kindly old man in a rocking chair in one of the upstairs rooms. And, form time to time, strange figures pass swiftly outside the windows looking into the garden. Another ghost in the village also preferred not to be seen. Neither did he make a sound. Instead he simply made himself 'felt' to the occupants of the house in Brook Street. This sensation was so frequent they called the presence 'George'. However a neighbour, who knew the house was unoccupied at the time, once saw a male figure at a rear bedroom window. Having a key she bravely entered the house, accompanied by her fairly large dog. However the dog was seriously 'spooked' and stayed back! Needless to say there was no burglar, still less an explanation for the figure at the window. Soon after, the interior of the house was redecorated in fairly bright colours. Seemingly this was not to the conservative taste of George, who was no longer felt, still less seen. And, finally, I was told that when venturing along Clay Street during the hours of darkness, I must look out for a phantom cat. Not that I will see it clearly – it slips into one's peripheral vision but is never there when you turn your eyes to look more clearly. I was faced with a huge bull-like figure in the middle of the road facing us with its right hand horn protruding into our path. I took immediate evasive action and swerved towards the verge but I still should not have had room to get through. I stopped and did a three-point turn to face back the way we had come. I drove back to where the 'bull' had been seen – but there was nothing! The verges are very wide there but we could see nothing! We all saw it but we still cannot explain it. It reminded me of pictures of the [now-extinct] Aurochs, huge head and long horns. Then, either late last year or early January this year , his eldest daughter, her boyfriend and their baby son were driving along the A6006 again. They had got closer to Asfordby and, after another right bend, they were faced with the silhouette of a large bull in the road. Her boyfriend braked hard but the apparition vanished before their eyes. His daughter also thought the apparition looked like a picture of an Aurochs on the Internet. 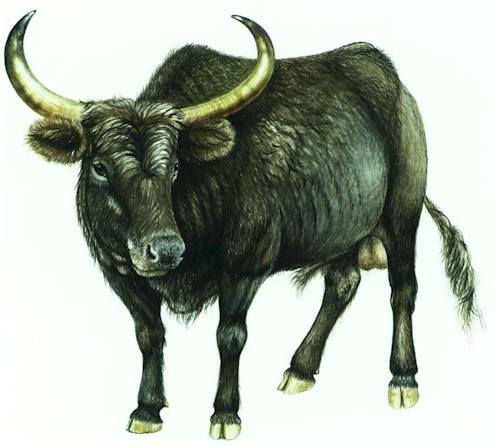 An artist's impression of an Aurochs. Aurochs (also know as Bos primogenus) definitely once lived in this area, as about fifteen years ago a skull was discovered close to Wymeswold (see cutting below). And the A6006 was almost certainly used by cattle drovers (who perhaps stopped off at the Durham Ox – a pub name typically associated with drovers – which became the Six Hills Hotel). But ghostly bulls and aurochs are certainly unusual in the annals of folklore. The boys who found an Auroch's skull near Wymeswold. I will be very interested to know more about any of the paranormal experiences mentioned, and even more interested to know of any other ghostly encounters in the Wolds; please email bobtrubs@indigogroup.co.uk or phone 01509 880725.